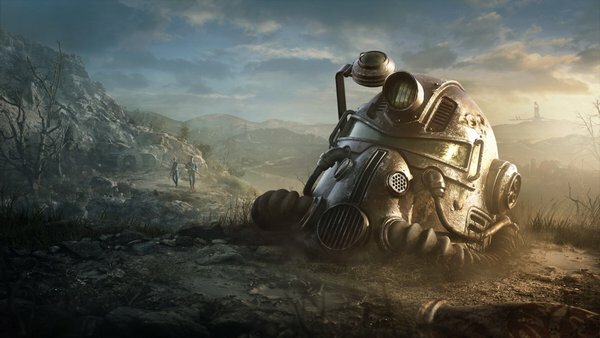 Home » Games » The “Sweet Little Lie” of Fallout 76: What Went Wrong? November seems to be the most controversial time of this year for gaming with a number of questionable events like the announcement of Diablo Immortal mobile game at Blizzcon 2018 and Fallout 76. Fallout 76 in particular is under heavy backlash from gamer community for lots of reasons. Back in E3 2018, this new Fallout title was introduced and expected to be one of Bethesda’s most ambitious projects yet. But today, it turned out to be a huge mess. So what did happen exactly? Is this new Fallout game another “No Man’s Sky” situation? Let’s find out! 1. What is Fallout 76? 2. Fallout 76: What Went Wrong? For those who are not into Bethesda games in general, Fallout 76 might slip off your radar until now especially with all the debacles surrounding this controversial title. In short, Fallout 76 is the spin-off Fallout game which follows the Massive-Multiplayer-Online style (MMO) rather than the traditional story-driven single player approach like previous Fallout games. 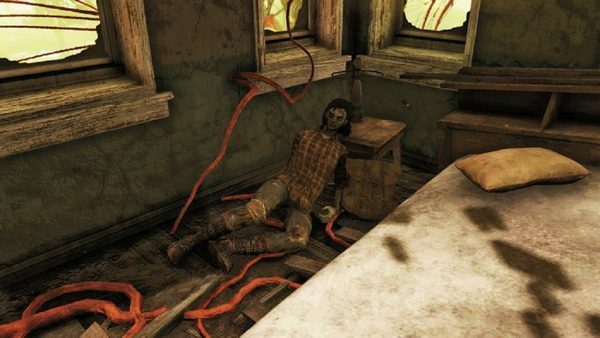 Like other Fallout games, Fallout 76 still takes inspiration from the post-apocalypse theme. The game is supposed to take place in an alternative history in year 2102, 25 years after the nuclear war, in West Virginia. Players assume the role as denizens of Vault 76 and together, they set out on “Reclamation Day” to tame the Wasteland. Just like a MMO game, players in Fallout 76 will be able to see, meet each other, team up, and explore the open-world Wasteland. And as Todd Howard – game director of Bethesda Game Studios – said, Fallout 76 is one of their most ambitious projects yet. It would have much more polished graphic, along with even better looks and details. Most of gameplay features from previous title Fallout 4 will also be found in this game, including exploration, settlement building, weapon crafting, sweet power armors, and of course the best stuff: nukes! Though graphic is indeed not the sole factor to judge a game, it still plays an important role of giving players a good impression and plus, helps players feel immersed in this virtual world. And in case of Fallout 76, it is unfortunately disappointing. Again, we do agree that graphic is not everything in a game. But this case, Fallout 76 disappoints in so much aspects that it is impossible to ignore its flaws, even slightest graphic issue. The general perception is that: Fallout 76 looks no different than Fallout 4, and probably even worse. Most of the assets like buildings look copy-pasted directly from Fallout 4. Then, if we look at the asset’s details, they do not look good at all in AAA standard. Looking at graphic alone, it is already completely different from what Howard stated in E3 2018 that “All new rendering, lighting and landscape technology, it allows us to have sixteen times the detail, and even view distant weather systems across the map.” And of course, there is no wonder why many players and reviewers can’t help but to take notice of such poor executions in reality. When Fallout 76 was first announced, players were somewhat afraid since they were afraid that story – an important aspect in previous Bethesda games – would be ignored. And again unfortunately, such worry is not that far away from the truth. To be fair, Fallout 76 does have a storyline. When the players finish their character creations, they can finally pick up the main mission and explore the outside world. At first, players may feel excited while following the main storyline. But just after a while, they will eventually realize that the storyline of Fallout 76 can barely be called as “story” at all. Most quests are delivered by some boring recordings. Most of the time players are asked to do tedious chores like fetching quests: come to point A, grab something, and grab to point B. Also, there is literally no NPC throughout the world. The only “NPCs” in the game are robots but they are hardly qualified as NPC at all since all they cannot express any sort of interesting dialogue or feeling to the players. 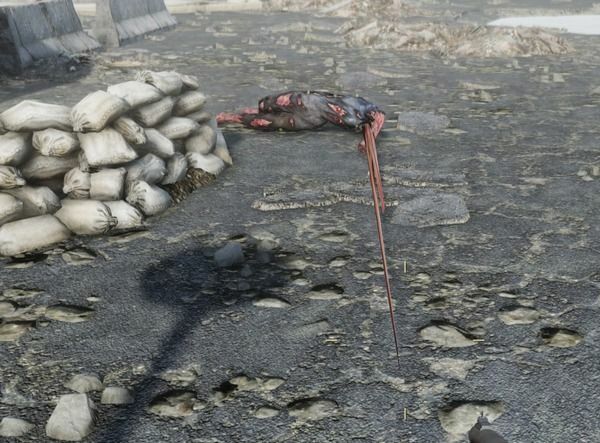 And so such lack of NPCs leads to another prime issue in Fallout 76: Its open-world feels so lifeless. 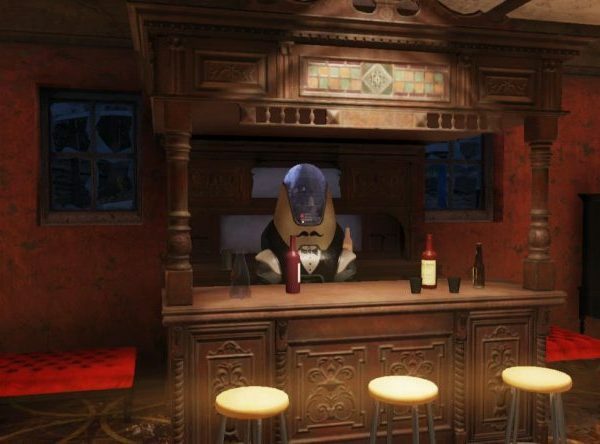 Due to the lack of human-like NPCs, along with tedious main storyline, players can hardly feel connected to this world. They can hardly care for any happened event since there is no incentive to do so in the first place. What about the monsters? Sadly they cannot make the world livelier either since they do not show any interesting characteristic or personality. That said, we have to give the game’s credit for its good variety of monsters. However, the problem remains the same: the monsters do not make the world feels better. All they do are spawning from nowhere and mindlessly charging at the players. If you are a fan of Bethesda games, you probably know the jokes when people made fun of Bethesda’s buggy final products. The thing is: back in the day Bethesda could get away with their buggy products since most of their games like Skyrim or Fallout 3 which have great values in general. They may have hilarious bug but at the very least, they offer solid single-player experience with enjoyable story. But in case of Fallout 76, it is a whole different story. To even more surprise, a Reddit user named u/SirSaltie even posted a massive list of bug. For more details, you can check out this Reddit post. In general, many people believe that this is all due to Bethesda’s sloppy work while polishing this game. It feels like they pushed the game out too soon while it clearly has not readied yet. 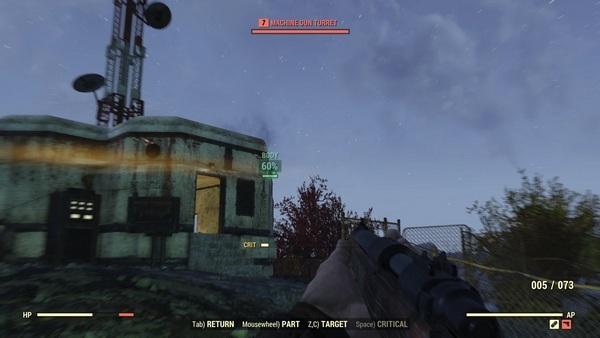 Some even reported that there were several bugs which existed back in Fallout 4 and thus, it further reinforced the suspicion of Fallout 76 being a copy-paste, broken version of Fallout 4. Of course, Bethesda will not ignore those bugs. In fact, they did release the first major patch which weighs… 47.258GB! The patch does try to fix certain issues; however, it is currently still not enough. Anyway, no doubt that Fallout 76’s buggy situation will eventually be fixed sooner or later. But for now, the game is still pretty broken and who knows how much time it will take to fix most of the bugs. 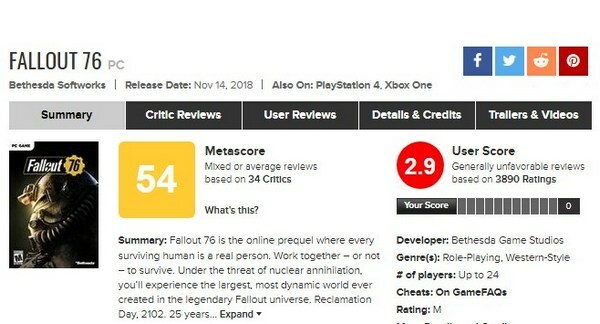 Needless to say Fallout 76 is now widely regarded as a half-baked, broken mess by the majority of gamers. If we check out various reviews from both critics and gamers throughout the internet, we can easily how badly the game is rated. That being said, there are still certain players who do find Fallout 76 fun, especially with friends. From our perspective, we do see their point. If we play this game with friends, it can provide us certain level of fun. That being said, those who can enjoy the game will need really open-minded perspective in order to see pass the game’s buggy issue and story limitation. And also, the same “playing with friends” can be a counter-argument since literally you can have fun with any game with your buddies. Fallout 76: An intended “Role-Playing Experience”? When we first heard of Fallout 76 back in E3 2018, we had a strange feeling regarding the nature of this game. And when we finally got to see the game in action, we reached to a conclusion: Fallout 76 seems to be a game for role-playing purposes. What does this mean? Well, let’s consider certain elements: First, the game takes place before any previous Fallout game. And second, as Todd Howard said, the “NPCs” players would see are real people. Combining these two elements, it creates a strong impression that Bethesda wants Fallout 76 to be like a playground, a “SIM world” to be exact where players can role-play in this world. 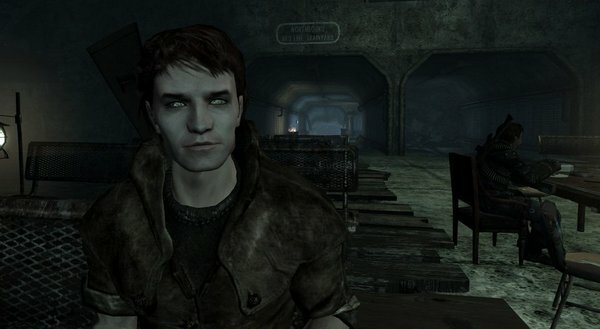 Players are supposed to be the “first people” who reclaim the Wasteland. They will establish their own lands, their own cities, and create their own quests. 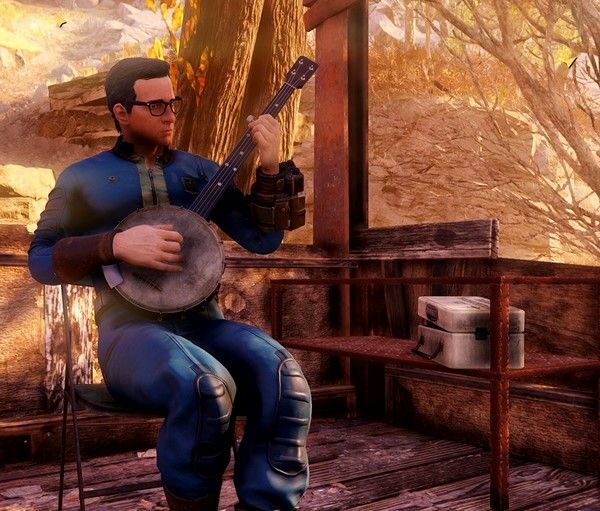 At first glance, this idea actually sounds interesting, but then there are 2 big problems: The game is extremely buggy, and more importantly, most players expect something else from Fallout 76 – a story-driven game in which players can co-op with each other. The first problem is pretty clear, but then we should discuss a bit about the second problem. Again, the problem lies within the idea of “role-playing”. As mentioned, most of players expect an authentic story-driven experience from a Bethesda game. And sadly Fallout 76 does not fulfill this expectation. On the other hand, the idea of “role-playing” in which players can become also be NPCs can only attract a very specific and rather small group of gamers. To some extent, we can say most players has not readied for such role-playing direction yet. Most players still prefer a traditional MMO experience with NPCs and pre-defined storyline. 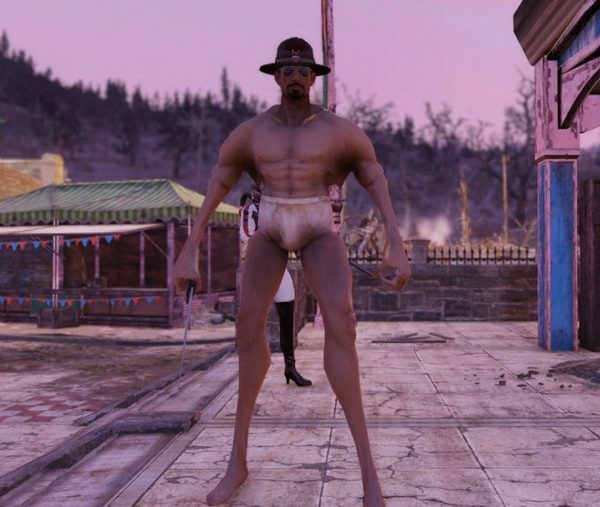 In any case, we can still not deny one fact that Fallout 76 is really a buggy mess right now. 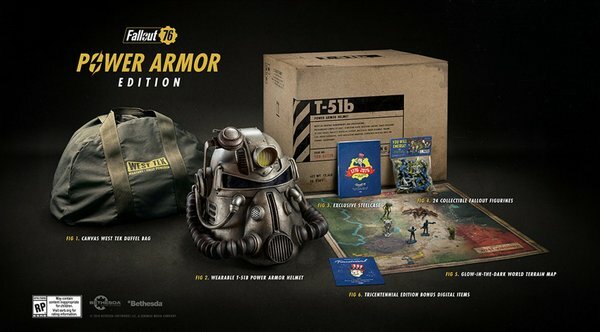 It is truly a $60 “wasteland” ($200 for the Power Armor Edition) and not only that, Bethesda even dares to put in microtransaction which only brings up even more rage from players. By the way, we have seen a number of opinions saying that Fallout 76’s bad quality is due to its ages-old Creation Engine. Yet, Zaric Zhakaron believes otherwise. According to his analysis, the problem of Fallout 76 is not about the engine, it’s about Bethesda’s responsibility as a developer and personally we think his idea is actually legit. If you’re interested in his analysis, we recommend checking out his video (and by the way, he has some really awesome Fallout lore and modding videos). And that’s it folks! What do you think about Fallout 76? Feel free to share with us and for now, thank you and stay tune for more news in the future!